View from the Hole 5 tee at Nellis Air Force Base in Las Vegas, Nevada. 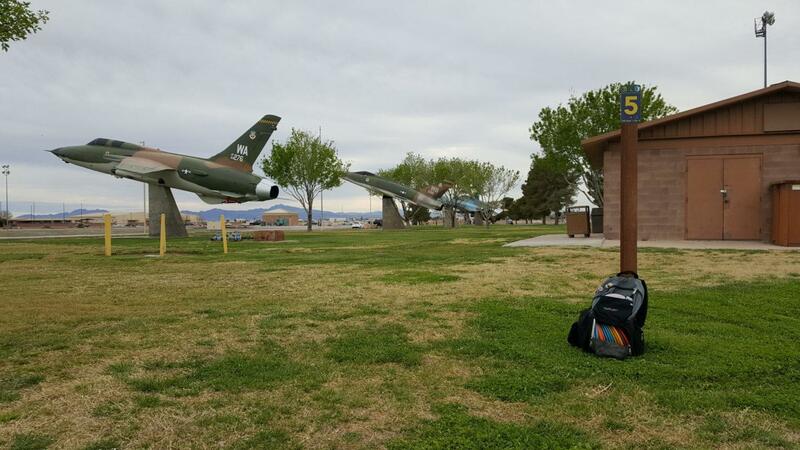 After hearing the jets rumbling across the Nevada desert the past three days while exhibiting at a conference for work, today I was given the very rare opportunity to enjoy a round of disc golf as a civIlian at Nellis Air Force Base in Las Vegas, Nevada. 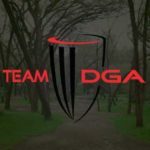 I had to use a little DGA “in” or pull to get permission to play on the base, as I was the person who designed the course’s tee signage. But personnel at every level of security were extremely welcoming. And Jennie Chance, who works in Outdoor Recreation at the base, walked the round with me while asking for my thoughts on making the course safer and easier to play and navigate. View near the Hole 5 basket at Nellis Air Force Base in Las Vegas, Nevada. The course starts out easy, then gets more difficult as you work your way toward the ninth hole. 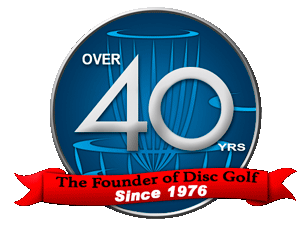 But it is not about the course design itself, as much as how great it is that the US Military is beginning to install more disc golf courses on its facilities. And Nellis does a great job trying to introduce new players to the sport. Even allowing personnel to check out camouflage backpacks stocked with a variety of discs! 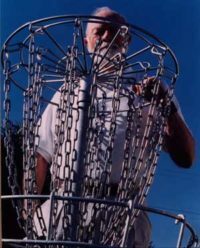 That impressed me, as they really do want folks stationed there to enjoy disc golf as a fun hobby, at minimum. With talk of creating leagues and occasional tournaments. Thanks again to Jennie and to Michael Romijn, for helping me get a temporary pass to be on the base. And thanks to all the personnel who are stationed there for your service to our country. 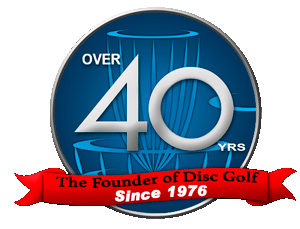 Our entire DGA family appreciates all you do to help ensure that we all live in a free country where we are allowed to enjoy a wonderful recreational activity such as disc golf.